Do you need an Outbuilding for your off-grid home? Have you considered choices for building your own outbuilding on your off-grid property? Clean dry storage space for off-grid properties is a common need. Each option has its pros and cons. Depending on many factors. What is your budget? What is your time-frame? What is your purpose for the building? Have you identified your goals? And once the building is standing (or actually even before it is completed) it is hard to believe how fast it starts filling up. Which type of building are you considering? Property owners often are faced with the reality that they need another building. In such a case, there are many options available, but each one has advantages and disadvantages that need to be weighed before picking a structure. The function for which a building is to be used plays a major role in the decision process. Someone wanting to build a pen that houses small livestock will have much different requirements than the person wanting a sizeable shop to house and/or repair vehicles. Functionality of a building also plays into the type of structural integrity and material requirements which also affect cost. An unlimited budget certainly allows the flexibility of choosing any option and style available, but chances are most people don’t have this luxury. Similarly, the desire for a very large building can often be hampered by the space available to build. Because of these two factors, property owners must be able to determine the proper size and style building to erect the right structure that will meet their needs and work within their limited budget. Each ..[building has] advantages and disadvantages that must be considered before making an informed choice that won’t be regretted at a later date. A simple shed or pole barn can be constructed using a landowner’s own raw materials, but pole barns can also be constructed of high-grade materials. 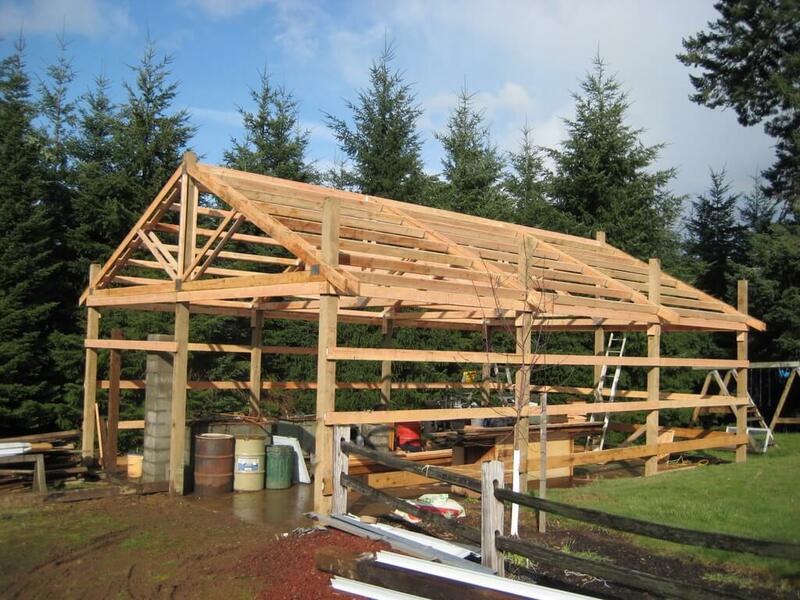 The basic premise of the shed or pole barn is to sink corner and support posts deep into the ground and then attach the framing and outer shell to these supports. Due to their more simplistic design, these buildings consume far less building material than the remaining types. 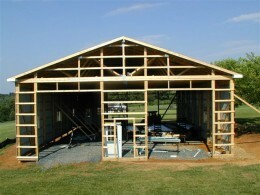 The stick-frame building is constructed in much the same manner as a typical home. A concrete foundation is built up and the remaining lumber framing is attached to the concrete. These types of building are not typical for most barn or storage purposes, as the increased cost of materials as well as the complexity of construction can burst most budgets. These structures are, however, less impervious to weather conditions than the simpler pole barn or DIY shed. Steel-frame buildings could perhaps be considered the best mix between the pole barn and the stick frame building. Similar to the stick frame, this building does require a concrete foundation. …These buildings typically come pre-engineered, and the materials are cut to size before arriving at the building site. In some cases welding members together is required, but most often this is not the case and the pieces simply bolt together. The greatest advantage of steel or metal buildings is that if properly constructed and maintained, they have a much greater survivability against major storms and are less pervious to decay than wooden structures. Lost for Thirty Years? Or Just Happy?